At Project Zero our perennial concerns about Paul’s wellbeing have been heightened in recent weeks. We recoil at the grim fate of journalists and aid workers held captive by the fanatical IS; we worry about the shifting turmoil and fighting that is unspooling across the Middle East and up to the borders of Turkey where Paul now walks, albeit far from the current hotspot of Kobane. While assuring us that he has good intelligence and is taking appropriate precautions – including altering his route – Paul quipped at the weekend that he looks forward to reaching more tranquil sections of his route. But by telling the stories of those whose lives have been caught up by the seismic changes afoot in the world, Paul is doing us a great service. Who among us could fail to be moved by his latest dispatch “This Is Not a Life” about Syrian refugees in Turkey? Who wouldn’t wince at this child’s drawing of the violence he or she has fled? 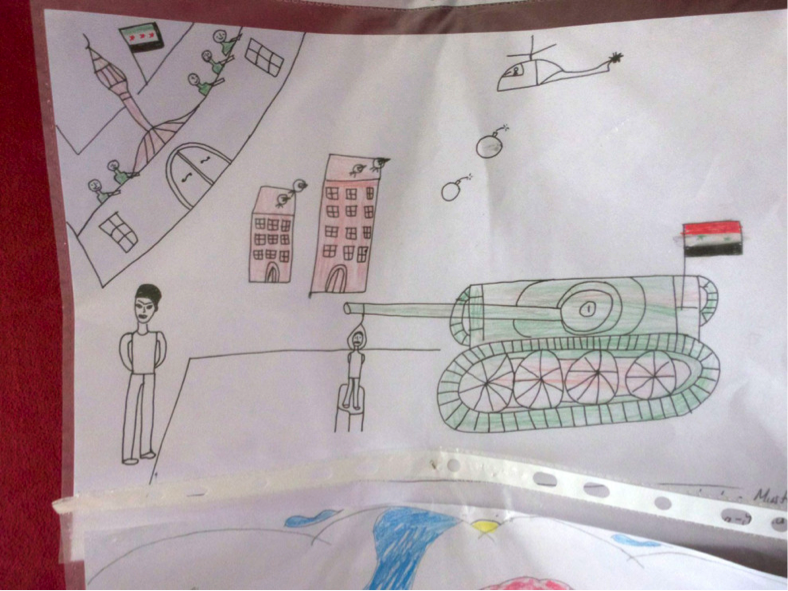 Trauma therapy: A refugee child’s drawing of a life left behind in Syria. Kilis, Turkey. PHOTOGRAPH BY PAUL SALOPEK for NATIONAL GEOGRAPHIC. Paul is helping to shed light on the human cost of war, making it more tangible to those of us who are otherwise carrying on with our comfortable daily lives, even if as Jessica Fei’s recent blog post pointed out, the seemingly endless barrage of bad news can weigh heavily on our hearts. His close, foot-level observations help us to identify some commonalities with people we have never met. The following passage from No Reply will stick with me longer than the latest casualty figures from the battlefields of Iraq and Syria, important though those figures certainly are. The Turkish border town was completely overrun. Its sidewalks swarmed with people carrying bundles, people carrying nothing. The crowds milled about pointlessly, in a daze. Some looked strangely embarrassed, as if they had been caught in some act of weakness. Some clutched their elbows. Young workers from the municipality walked among them, handing out shiny packets of biscuits. Welcome to Turkey. Here are your biscuits. The idea of being embarrassed about being an uninvited guest in a strange place struck a chord with me, as did the detail of refugees holding on to their own elbows, perhaps to shore themselves up. And then there are those “shiny packets of biscuits”: symbols in some way of comfort and kindness and yet so entirely inadequate for the enormity of trying to start a new life in a new country. For me, part of the power of Paul’s storytelling comes from his matter of fact and unadorned descriptions. He does not embellish people’s suffering. In This Is Not A Life, for example, he draws attention to the perhaps surprising comfort of the model refugee camp of Kilis, Turkey. But at the same time he captures the quiet horror of the banality and purposelessness of everyday life for people whose lives have been caught in limbo. Similarly, in Tomatoes, which he wrote back in January, Paul conveys the precarious existence that Syrian refugee families are eking out amidst piles of rotting tomatoes on the fringes of the Jordanian desert. We have incorporated an annotated version of this dispatch into Footstep 4 of our current learning journey and look forward to hearing from educators about how their students respond to this piece. But an ongoing question I have is this: in the face of what seems like unmitigated bad and even frightening news, what should be the overall role and response of Out of Eden Learn? Are we in fact looking to nudge kids to respond in a particular way? Do we want them to wring their hands and feel sorrow for those less fortunate than themselves? Do we want them to start or sign a petition by Avaaz, for example, to put pressure on the international community to do more to help refugees? Do we want them to organize a bake sale to raise funds for relief work? Do we want them to take some kind of action in their local community to address a more manageable issue? I don’t have ready answers. However, looking ahead we hope to offer specific opportunities for young people to engage thoughtfully and meaningfully, in an age appropriate way, around important issues of our time including injustices they can see around them in their own communities. For now though, I have to believe that the three main pillars of the Out of Eden Learn experience – inviting young people to slow down to observe the world carefully and to listen attentively to others; to exchange stories and perspectives with one another; and to reflect on how their own lives connect to bigger human stories – offer a much needed counterpoint to some of the bad that is going on in the world. If our participating students can come to understand in an experiential way that there is a power to seeking out and listening to other people’s stories, that we are all ultimately connected as fellow human beings, and that we are all actors in an unfolding human story, then I think that we are taking important first steps as educators to help prepare them to take on some of the challenges and injustices that are happening out there in our world. We welcome suggestions on what some further steps could be. When I shared Paul’s latest post with my class (10 out of 14 are in 9th grade) they were quiet and concerned…but it was so new to them. I hope to find out more about what they think, but I have had an unusually difficult time getting something authentic from these young people regarding their p.o.v. Hopefully some more time focused on Paul’s Journey might help? Regardless, what we think as adults (at least here in this class) is pulling from life experience and reflection my students don’t have yet…which led to my first Journalism assignment which I will share in the forum. Great, thoughtful post, Liz. Thank you.